These beautiful jars will be perfect at any wedding or birthday party! Pull out the small glass jar (about pint size). Cut a strip from desired print in the DCWV’s Mercury Glass stack at 2-1/2”x12”. Wrap this around jar, securing it in place with double-sided super sticky tape. 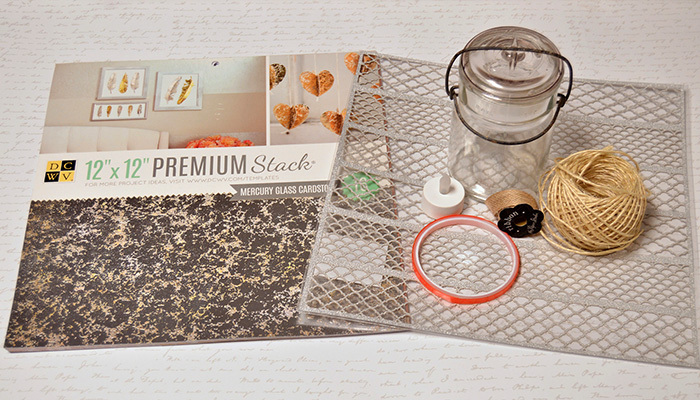 Cut one section of the 12x12 Silver Shimmer Die Cut sheet (2” wide x 12” long) and wrap it around the jar. Secure it on the backside of the jar with mini glue dots. Wrap a strip of 5/8” Natural Burlap ribbon around the center of the paper, tying it in a knot in the front. Using an electric die cutting machine, manual die cutting machine or paper punches, cut a 1-1/2” and 1” star from the silver and gold paper in DCWV’s Mercury Glass stack. Score both stars from top to bottom at each point. Bend the stars with a mountain fold at each point and a valley fold at the other score lines. Tie a piece of natural twine in a bow to the handle, making a knot at the end of each string. 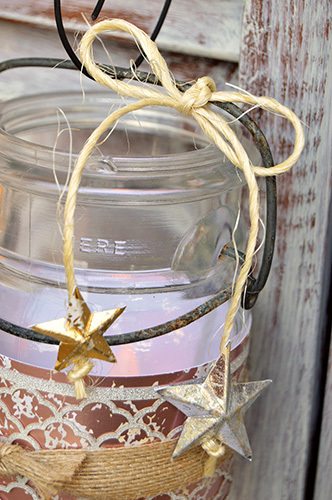 Use glue dots to adhere the stars to the ends of the twine ties. Add battery operated tea light to jar. 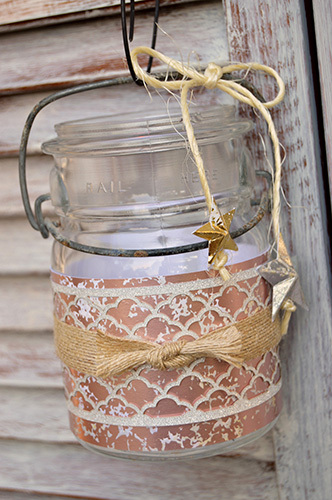 Make a collection of jars to add outside your house!